Fits great. This is second time I’ve order this. Great for game & card playing & protecting my table. Yes, the elastic band makes it fit our square table perfectly! This is perfect for my husbands next kidney fundraiser poker game! He really likes it & is very happy with it. Just like a real porker table! We had been looking for a table cover like this at various websites but most were very expensive. Puschased this one for less than $20.00 and it is perfect. Our table is oblong and it fits great. My husband and his buddies love it for playing cards! 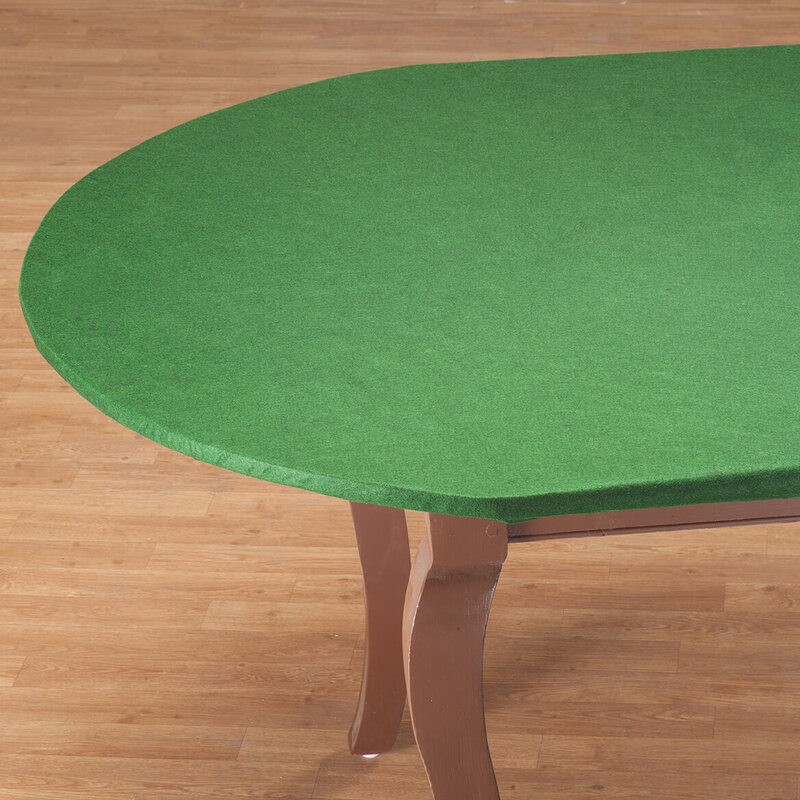 The felt table covers are used for game and poker nights at our gated community center. The players love them. Deadens the sound and make for a great surface. 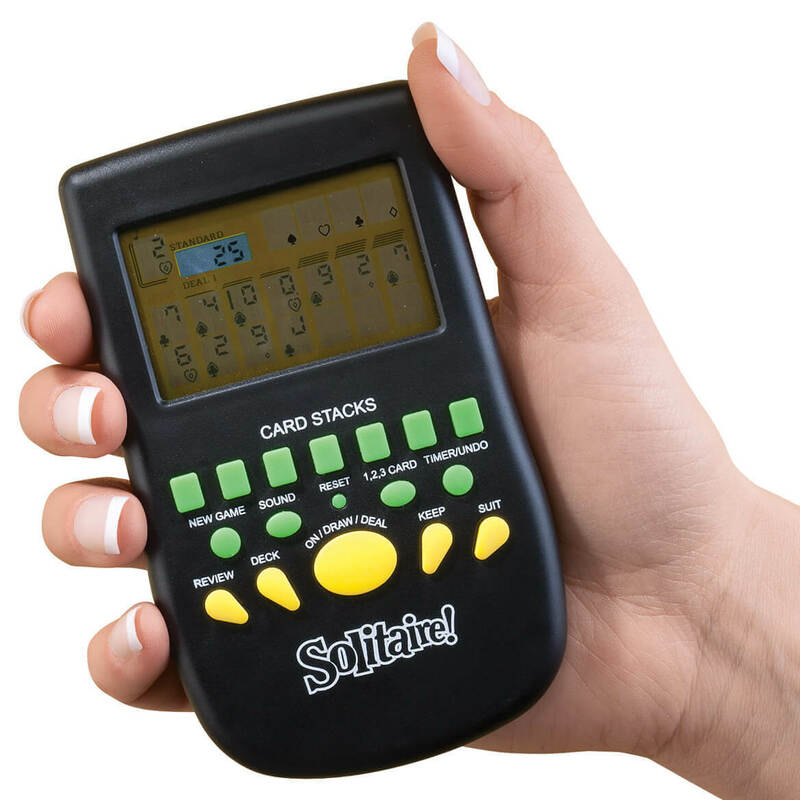 Great for the game table, I use it to play canasta and dominoes to protect my table! Most wonderful game covers that have elastic around the edge for a firm table cover for cards. Inexpensive and much nicer than a bare table. It fits perfectly over my glass top table for rolling the dice on when my friends are here for Bunco. I had looked for a felt one for a long time. I am buying a couple more sizes for my other tables. Like this very much. Makes game playing easy to see maneuver! I use this on my 42in round table for playing Mahjongg. I was concerned that the material might be so cheap that the tiles would not move smoothly on the surface, but that's not the case. It works perfectly. Easy on & off! Perfect fit. We love our table cover. It's used for card and table games with friends and family. So easy to use that our grandkids can do it. Have recommended smaller cover to friends. 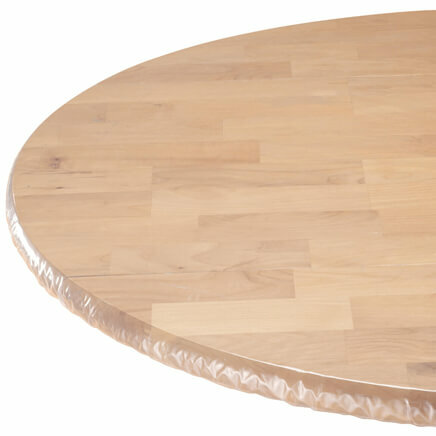 Even fits our 50 inch round table when we add the extra leaf to make it oval! Felt tablecloth for table larger than 48" was hard to find. This one fits the table, stays tight with elastic on outer edge. Protects wood table top from scratches and bumps. Found it because some friends had one that they have used for several years which has held up well. My puzzle board was slipping on and scratching up my antique table. The felt cloth is the perfet protection for the table which I spent many hours refinishing. Friends have inquired about where I purchased and I forwared them to you. This cover is great to keep cards from sliding across my wooden game table as they are played. I was worried that a round cover wouldn't fit the octagon shape, but it works perfectly. Since I haven't washed it yet, I can't comment about the durability. I do wish it came in different colors. I don't really care for the "pool table" green in my house. Cover a dining room table and use it for mahjong. I have a custom made table that I was having difficulty finding a felt cover for when we play cards and other games such as dominoes and Mah Jong. I purchased this cover and it is a perfect fit. Everyone loved it and they were all asking where I purchased it. It is also well made. Don't hesitate to purchase. You will not be sorry! LOVE it! 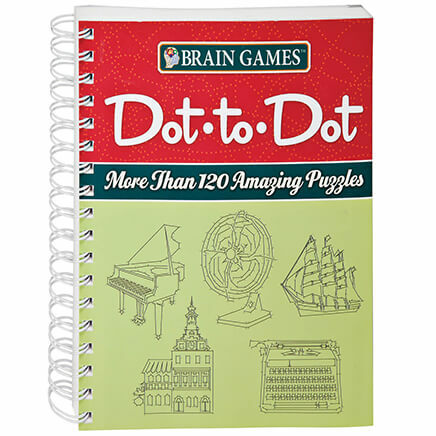 Use on a game table. Cards and dominos slip easily. This table cover is perfect. Fits my 54" round table just right. Good quality material. I am very happy with my purchase. They fit well on the tables. Makes picking up cards so much easier. Covering a conference table to play mahjong. Very nice purchase for a gaming family. Playing games. Perfect xmas gift. I was able to turn my round dining room table into a game table with the cover. I needed this felt topper to protect my glass-topped dinette table when I host a mahj jongg game. It is easy to see the tiles on the green color and the felt deadens the sound. Cons: It is difficult to get the topper onto a table alone -- you can hitch one half of the topper onto the table, but when you move around to the other side and start to pull, the felt slips off the side you just finished. I practically have to lie across the table top to hold one half in place with my body while I reach over to stretch it over the other side. I am also worried that won't be able to clean the felt should someone spill coffee or tea. good felt cover for playing card games. fits perfect over my table. 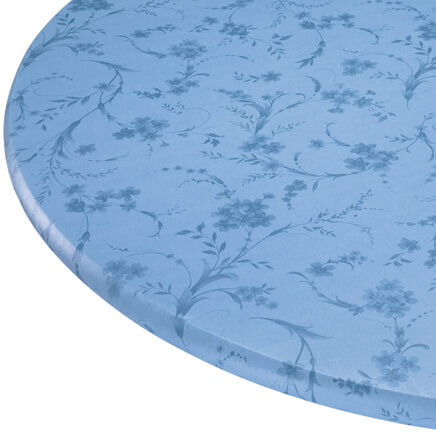 I ordered the cover for a round breakfast table with glass surface. We use this table for playing cards. The cover converts it nicely to a game table. I would recommend it for this use. The only negative is that it cannot be put in the washing machine. The same product in another fabric would be ideal. Now I have a game table! Haven't used it yet but tried it on my 48" kitchen table. It was instantly transformed into a game table! Can't wait to try it out. Purchased one for myself, it was perfect for card playing. Great over my glass topped table. Am buying another as a gift to a friend. Haven't washed mine yet, so can't be sure about the quality. This is just what I was looking for to protect the finish on my new table. It's for my vacation home, we play games and cards. Fits my 48" round table very well. Haven't washed it yet. Great price! Very pleased with [...] condition of the product. Fits my round table very nicely. This felt cover fit my round dining table perfectly so it can be used for playing dominoes without scratching my table. Fits perfectly. Concerned about wear over time as puzzle pieces stick a tad to table, but so far, no pulls. Product exceeded my expectations in terms of fitting my 46 inch table and lies smoothly on the table. Really happy with this purchase. too tight for a 48 inch table. We bought this for a round table we use for card playing. but, the felt is pretty thin and not as durable as the felt we had bought originally, from a fabric store. But, we do like the idea that it is fitted. Would not have bought it if I had known that the white elastic on the green felt looked so tacky. It was too small had to return. The square one only has a 2 inch length of elastic at each corner so the straight edges do not hang well. I could make one better myself for much less money. 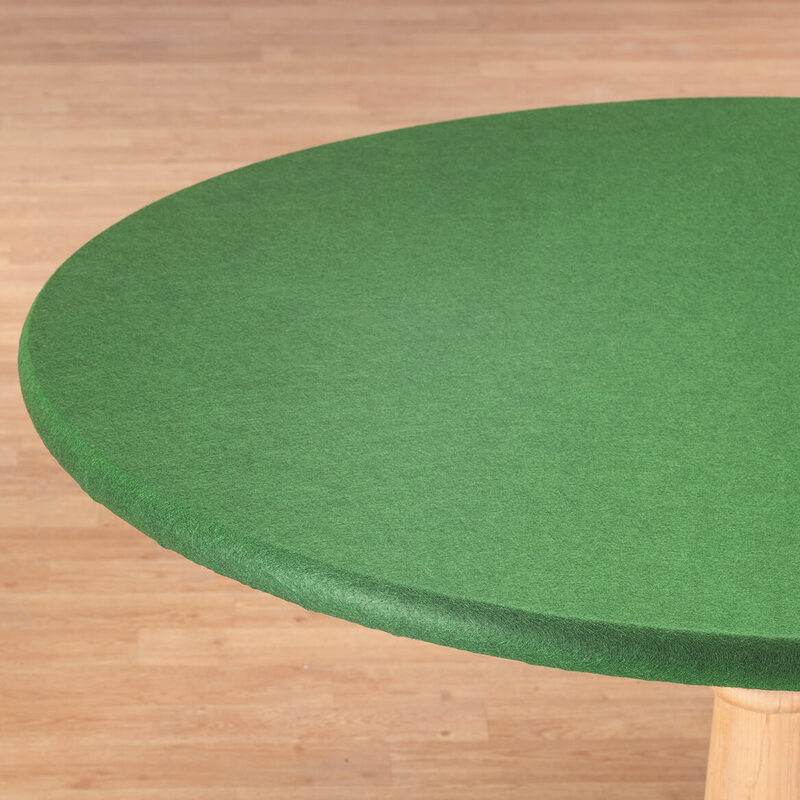 Have been looking for felt table cover for a little no time! Best cover to play cards on. My family & I are always playing card games. Just thought it would look nice having the real felt tablecloth. So professional looking. I have ordered other things from you & have been liking them. We wore the other one out! Needed a new one. I thought it looked more like a card table should look! I needed a table cloth for my game table. Playing cards do not slide around on felt. This makes card games so much nicer - quieter with no chance of cards sliding across the table! Difficult to find. Good price. Hope it fits and lasts. Because I need one & this is the only place I found one. 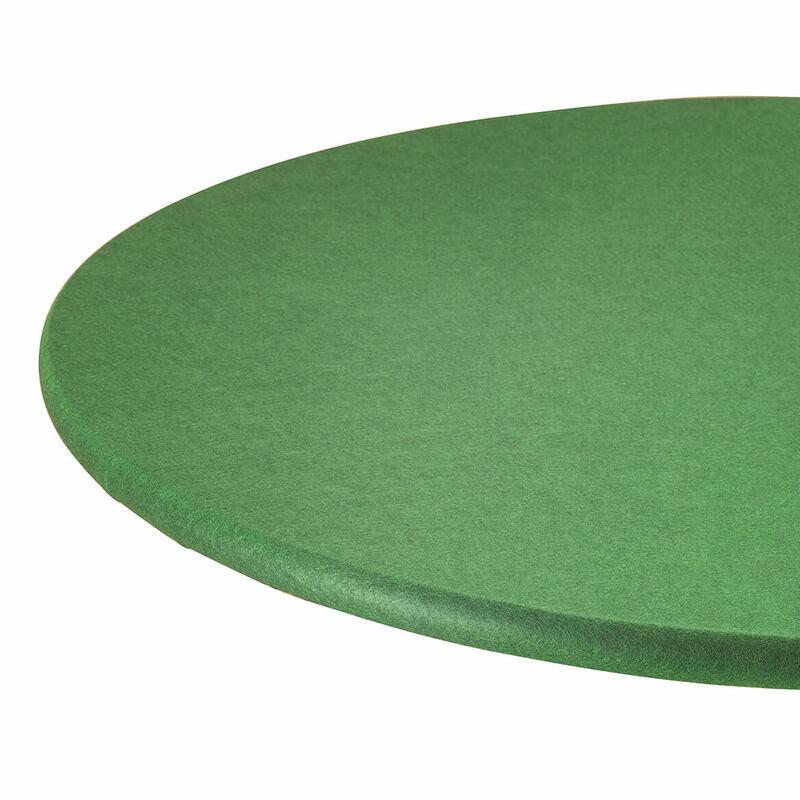 Right price for 60" Round Poker table cover. Have one and is wearing out. Buying for others who want one also. I have this in another size. It protects my table. M friend just purchased a table for his game room. Now he needs a cover for the table. I bought this product years back and finally wore it out. For the price I don't think you can buy a better table cover for occasional game playing. Our table is 48" square and the XL round fits OK.
Works well with keeping the table noise down while playing games. I Love playing Cards on my Round Glass top table and I think this will be nice and a good cover to protect table top during the games. Had one before but wanted a bigger one, hope it fits a rectangle table. i needed a oval felt cover for my kitchen table to keep my linen tablecloth from sliding and MK had the size I needed. I never received this table cover. Great cover for game table. In stock, fair price, cannot judge until I receive it. I played mahjongg on this table cloth with friends and it was very well fitting and worked well. I am now buying it both for myself and another friend for her birthday. Excellent price and choice of sizes. This is the second I've purchased and they are very handy to save tabletops! Trying to see if it will work for my purpose. Playing dominoes on 54" table. BEST ANSWER: I do not really know. Never washed it. It began spalling almost immediately and appeared to be of rather quality felt. I have quit using it and bought a vynlel cover that, so far, has worked fine. I haven't washed it, but it looks like it would pull apart if I did. It also got little balls all over it like a sweater sometimes gets and needed to be shaved. I have never washed it, I would say it would not turn out well. When they get used a lot I have just purchased a new one. I haven't had to wash mine so I can't answer your question..sorry. I have enjoyed mine. 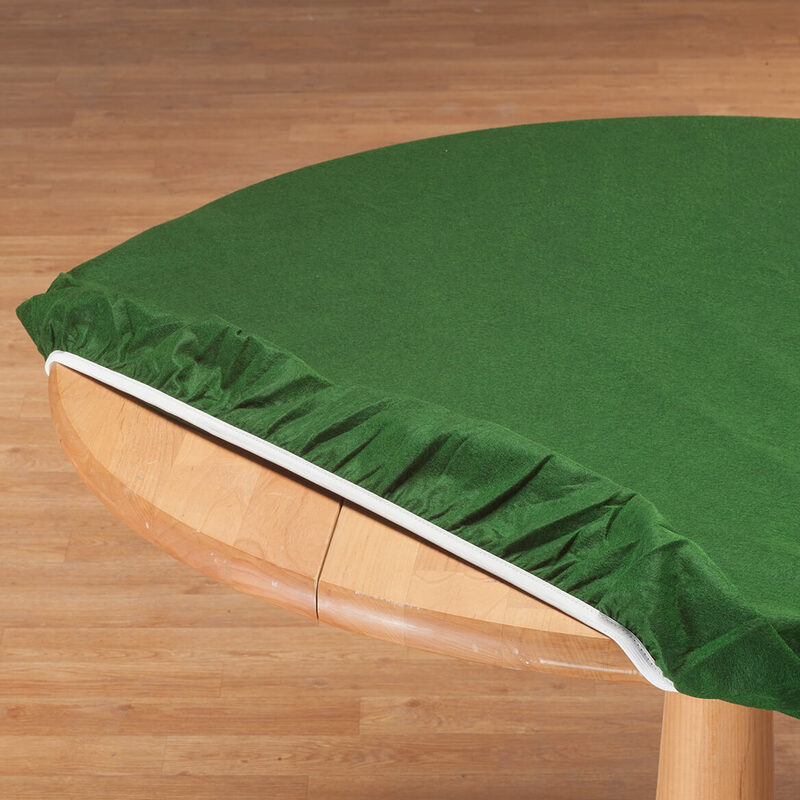 The felt table cover is of good quality and fits perfectly to play poker on it!! Washed in warm water...made it fuzzy. Should have used cold water. Haven't tried to wash it. I doubt that it is washable. Look at description....it is only to be wiped! I haven't washed the one I purchased. Do you do different colors? BEST ANSWER: Thank you for your question. Unfortunately no, this item is only currently offered in green. We hope this information will be of help to you. I would like to but have not seen anything but green. BEST ANSWER: Thank you for your question. No, the only color it comes in is green. We hope this information will be of help to you. Will the XL fit a table 60 x 42? BEST ANSWER: Thank you for your question. The XL is only for a round table it will not be able to fit an oblong. We hope this information will be of help to you. will it fit a 64" round table? BEST ANSWER: Thank you for your question. Yes please order the XL size that is only size that will fit your table. We hope this information will be of help to you. i have a 36 inch square table with 2" deep sides, Will the table cloth fit that table and be able to accommodate the deeper sides? BEST ANSWER: Thank you for your question. Yes, it will fit your table. We hope this information will be of help to you. BEST ANSWER: Thank you for your question. It is only spot clean. We hope this information will be of help to you. would the XL fit an oval table? BEST ANSWER: Thank you for your question. The XL will only be able to fit a round table. We hope this information will be of help to you. 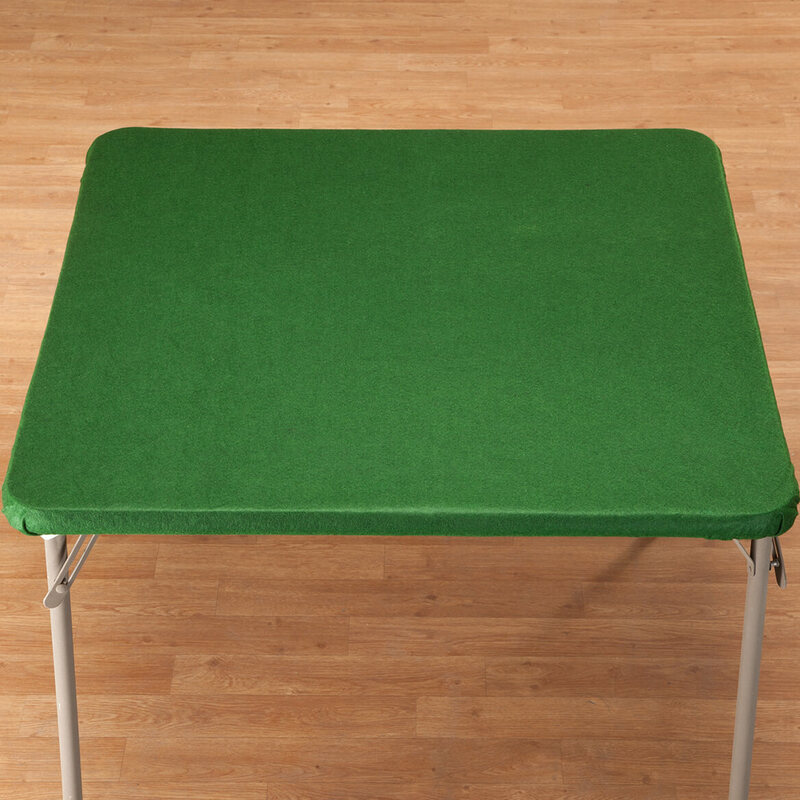 how to order round XL game table cover? BEST ANSWER: Thank you for your question. Please choose XL from the drop down menu. We hope this information will be of help to you. I need XL Round felt to fit 66" dia. round. Is it available? BEST ANSWER: Thank you for your question. The XL round game table cover fits 49"-66"dia. round, hexagon or octagonal table cover is available at this time. We hope this information will be of help to you. How do I measure for round cloth?? BEST ANSWER: Thank you for your question. For a round table, you need to measure the table's diameter. We hope this information will be of help to you.